← Our trip to Marie Grosholtz! Year 3 currently looks like a branch of ‘Subway’ at the moment…just better! As part of their current topic, the boys and girls in Year 3 have been making some delicious healthy sandwiches this afternoon…and they looked truly scrumptious! 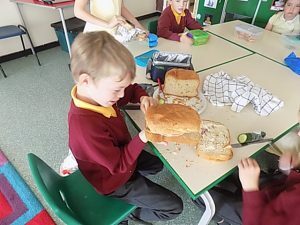 The children brought in their own ingredients to make their sandwiches…and Alex and Leon even brought in their very own homemade bread! Well done, Dad! Such learning experiences are truly invaluable…and delicious too! This entry was posted in General News, Year 3. Bookmark the permalink.